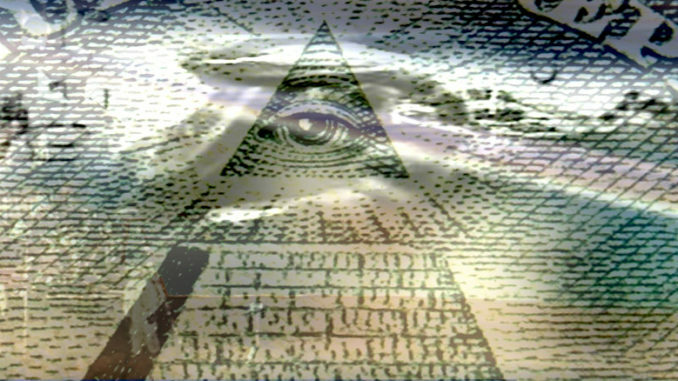 That mysterious eye in the pyramid on the back of U.S. dollar bills… what does it mean? It must have some great significance, or it wouldn’t be on the money. It does have a significance. Specifically, it’s the reverse face of the Great Seal of the United States. It’s on the dollar bill beside the front face of the Great Seal, so that all of the most commonly traded denominations can present the full version of the Seal. We have a Great Seal to demonstrate when documents are presented that have the full force of the U.S. Government behind them. Diplomatic missives, for example, or treaties, or proclamations of holidays… the Great Seal has been historically useful. The eye in the pyramid looks odd, though. It is supposed that the eye is meant to indicate the government, but what does the pyramid represent? In actuality, it is not an eye in the pyramid. It is not even an eye on the pyramid. It is an eye over the pyramid, and that distinction is important, because they are two different images. The pyramid was chosen for the great seal because it was a man-made structure which had lasted for thousands of years. When the seal was being designed in the mid 1770s through early 1780s, the founders wanted an image which was easily recognized and recalled stability. A pyramid was chosen, and it was meant to represent their hope that their new nation would last for thousands of years. Thirteen steps indicated thirteen states. The eye is known as the Eye of Providence. It is a piece of Christian imagery which predates the founding of America by centuries, and which has been argued developed from the Egyptian symbol of the Eye of Horus. It represents God keeping watch. There, on our money, far more dramatically than a simple “In God We Trust”, is the evidence of the theological bent of our country’s founding. The Great Seal doesn’t implicitly say which God is watching over us, but it does promote a general respect for religion. And then there are the Freemasons… they also use the Eye of Providence in their iconography. Many have used this to prove that the Freemasons were secretly in charge during the founding of the country, or that they’re still pulling strings behind the curtain. The simplest answer is usually the best, though. Just as two streams may share the same spring as their source, the Freemasons also use the Eye of Providence as a reminder that God is watching over them. It is not a symbol that they have eyes everywhere; it is a simple recognition of their orders’ religious origins. It is possible that the use of Masonic temples as occasional gathering sites for the patriots of the American revolution inspired the eventual use of the Eye of Providence on the Great Seal. “Hey, we want something that shows God watching over the country… what about that triangle-eye thing from that temple we used a couple of years ago?” But the notion of it being Big Brother, in either the form of the Freemasons or the U.S. Government, is, well, bunk.